Welcome to our Resources page. This page has been set up to provide players, national associations, and/or tournament directors the material they would need to assist them with growing their Scrabble Organization or organizing their Scrabble tournaments. Resources have been divided into categories to allow for ease of finding the information you are seeking. Simply click on the wording that relates to you to reveal web based resources on that topic. Where existing Scrabble Associations have already posted content on their website on the topic you are seeking, we have linked directly to that page for your convenience. Any WESPA-specific resource (e.g. Rules) have their own links within our site. We hope you find this page useful. For all feedback, additions, and corrections, please email us. 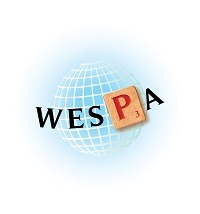 How do we become a member of WESPA?